Surface Pro 2 is recommended over iPad Air. Most reviews you’ll see gush over the iPad Air, despite the largely unchanged device from 2010. Conversely, those same reviewers grudgingly acknowledge the Surface Pro 2. In a head-to-head comparison, you generally hear both devices are an equally good purchase with offsetting strong features. Perpetuating such a notion seems like a weak attempt to not offend a major sponsor. Unlike any main stream media or tech websites, Matrixforce derives no ad revenue from Microsoft or Apple. We also don’t sell either product. However, we have provided technology support nationwide for the past 35 years and thought it was important to squash the current confusion and hype. Our only motivation is less frustration and ease of use for you. Form – Surface Pro 2 has a two position kick stand, so that you don’t have to always hold it or buy a pillow to stand it up like an iPad Air. Get a Type Cover 2 with a backlight to bang out a document or long e-mail. You just can’t do that with the iPad Air. Nearly 4 years after fist made, the iPad still cannot accept a USB thumbdrive or print to a network like the Surface – much less have a docking station to use as your only device. Yes, iPad Air is a half pound lighter with a few more pixels on a slightly smaller display. For the Surface Pro 2, the weight difference is approximately the loose change in your pocket and people generally appreciate another inch of display over the unnoticeable resolution contrast. Ecosystem – Starting in 2007, Apple removed “Computer” from its name fleeing the long and dreadfully losing computer software and hardware battle to disrupt the entertainment industry. Beyond iTunes, every cloud service for Apple is fledgling at best. 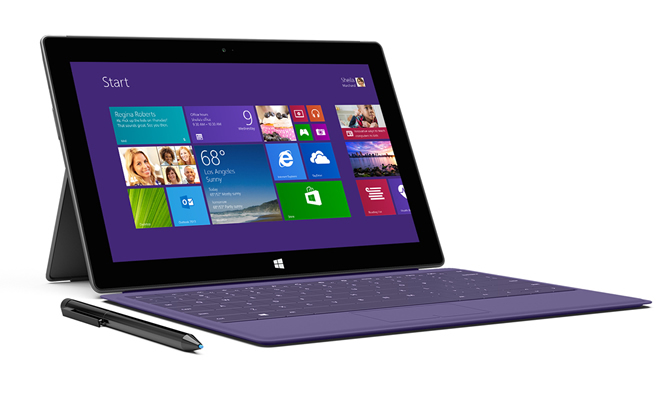 Microsoft provides Surface Pro 2 users 200GB of SkyDrive storage versus Apple iPad Air paltry 5GB of iCloud. iWork for iOS was just released in October 2013, while Office 365 is nearly a $2 Billion dollar per year online service for Microsoft – dominating the globe for businesses and consumers. Infinity Blade was developed specifically for Apple, but Apple has no gaming console or thousands of games like Microsoft’s Xbox Live. After over 65,000 apps in the Windows Store, Microsoft can’t be said to be lacking. Apple even uses Bing as the default search engine, as attempts at services like mapping were a disaster for Apple. The Surface Pro 2 gives you the power of a full-blown workstation with the versatility for your everyday personal wants and business needs. Unlike iPad Air where you’re pretty much crippled outside of the limited Apple ecosystem, Surface Pro 2 readily accesses all types of systems and third-party programs – even competing products like Google Chrome.